Nepalese farmers drink wheat beer as they work at a rice field in Chunnikhel, Katmandu, Nepal, in June. On Friday, I responded to a question from a reader who wanted to know how many people had, like him, never had a drink of alcohol. After looking at trends within the U.S., I compared the percentage of lifetime abstainers in countries across the world using data from the World Health Organization (WHO). People in Islamic countries conformed to assumptions (mine at least) about being the most likely to abstain from alcohol, but what about international trends in alcohol consumption? Luckily, being a health organization, WHO isn’t just interested in who is and isn’t drinking — it wants to know what’s in their glasses and how much they’re knocking back. It has national data on average alcohol consumption per capita for those age 15 and over in each country. The data also describes consumption by beverage type: wine, beer, spirits and “other.” To break consumption down by beverage, WHO again used government records as well as statistics from the alcohol industry and the United Nation’s Food and Agriculture Organization database. Some of that data conforms to stereotypes. The French consume more wine than people in any other country — 370 glasses of wine per person per year, compared to just 84 glasses in the U.S. 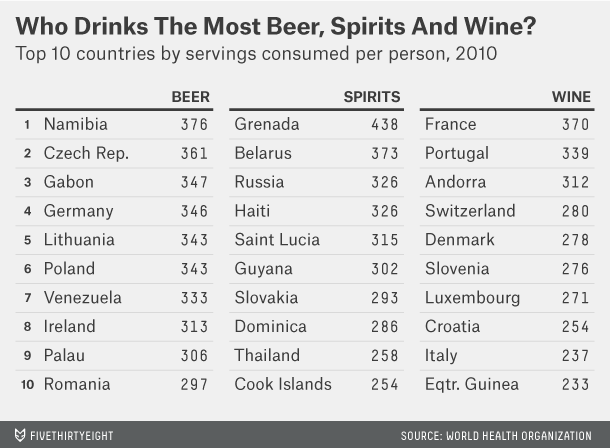 Remember though, these are just drinking figures per capita — they don’t take all those abstainers into consideration. The wine consumption of the drinking population of France will be higher still. Namibia is the world’s biggest beer-drinking country, with 376 12-ounce cans of beer consumed per person. In Germany, the average is 346 cans, and in the U.S. it’s 249 cans. If you assume that 1.5 fluid ounces is a normal measure of hard liquor (that’s about a shot-glass worth), then the average person in Grenada drinks 438 measures of spirit per year. That’s far more than any other country — including Russia, where the average is 326 measures. But there’s an even more simple explanation for changing tastes in spirits: availability. Beyond spirits, we do have some idea about the popularity of alcohol in the U.S. 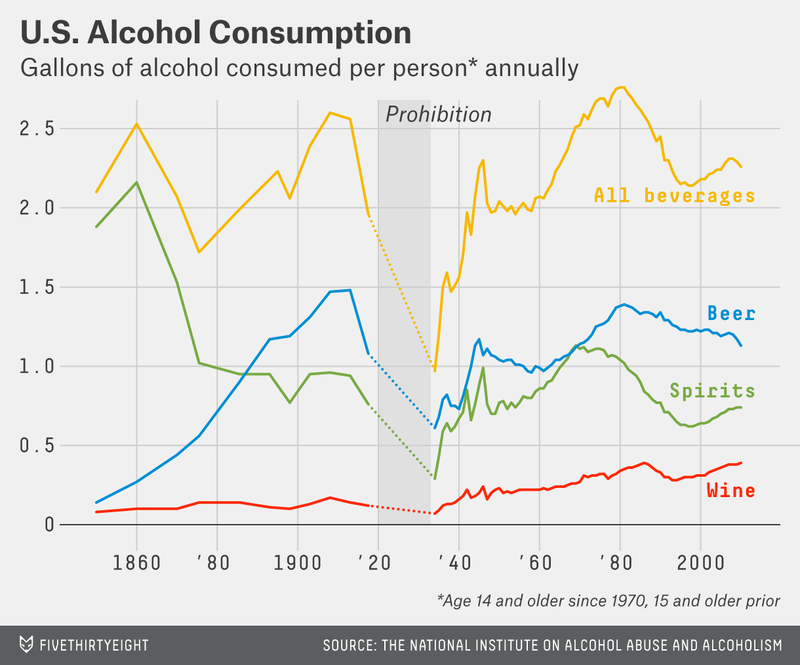 The National Institute on Alcohol Abuse and Alcoholism has data going all the way back to 1850. Overall, it shows that after prohibition, alcohol consumption per person (age 15 and over before 1970, 14 and over thereafter) rose, peaking in the early 1980s at 2.76 gallons per year, then fell in the late 1990s before rising again to 2.26 gallons per year in 2010. The data also demonstrates changing American tastes. In 2010, wine consumption was the highest it had been in any of the previous 160 years. Since the 19th century, beer has been a firm national favorite. Although spirits briefly caught up in the 1960s, beer is consumed more than any other alcoholic beverage. Have a question you would like answered here? Send it to dearmona@fivethirtyeight.com or @DataLab538.